Returning from a staff meeting which included discussion of our upcoming Year End Show, I found this charming handmade envelope on my desk. And there it is: The power of asking. The power of action. On my class action board, this belong in the category of ‘Conversing’. However, it got better. They also included a beautiful promotional poster! Well that sealed the deal. One can only imagine the inspired and authentic collaboration that went into this. It is packed with language, visual arts, and design applications. It is also an ideal artifact of social and emotional learning. 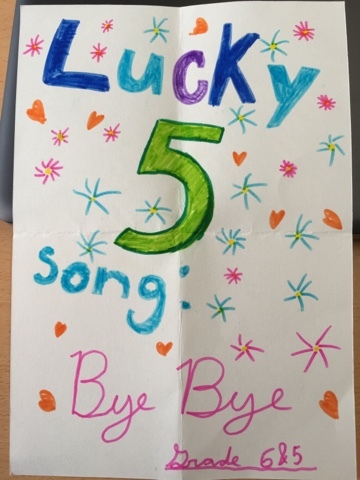 Needless to say, Lucky 5 will perform their single, Bye Bye, at our Year End Show. I spent a short amount of time today substituting for an absent primary grade teacher. The lesson plan called for a sight word practice game. The teacher left instructions, but years of experience as a substitute teacher taught me that the students would give me the clearest idea of how the game is played. 1 Each student has four word cards arrayed on their desks. 2 The teacher calls one of the words and students race to see who can select the correct word and hold it over their head. 3 The slowest student is ‘out’ and becomes the judge for the next round. 4 After being a judge, the slow students wait at the front of the classroom until only the two fastest students remain for a final duel. The glaring problem with this game is that it is competitive. Especially in classrooms with 8 year olds or younger, games should be cooperative so that each individual’s success benefits the group, and the group supports the learning of members who are challenged. The card game we played today accomplishes the opposite: Students who are ‘slow’ were, in a sense, shamed by standing for the rest of the game at the front of the room. What’s worse, the ‘slow’ students who need the most practice play the game for the shortest amount of time. In fact, the slowest student is ‘out’ after the first round! My improvised quick fix was to redesign the rules slightly. The student fastest to hold up the correct word card would become the judge for the next round, a job that the students were excited to compete for. The student slowest to hold up the correct card would choose the word for the next round, an opportunity for oral language support with the teacher and empowerment by being the leader of the game for a turn. The result was a game which maximized student practice. Since no students were ‘out’, nobody was standing around doing nothing. Confident students were engaged in the competitive aspect of the game while those with less confidence had different chances for practice. I wouldn’t claim that the game has been perfected. After all, it remains competitive. However, I think my modifications did reduce the severity of the competition. Students were more engaged because everyone could play every round and maximize the amount of time practicing. Do you play any classroom games that could benefit from less competition and more cooperation and equity? Of the facets of the IB Primary Years Program, my Grade 5/6 class emphasizes Action by focusing on three elements from our school’s Mission Statement & Philosophy: ‘inspired’, ‘independent’, and ‘contribute to world peace’. With this in mind, in the first week of school we discussed and agreed to a class identity: Uniters. Rather than addressing my class as ‘Grade 5/6’ or ‘children’ or ‘hey you’, I say ‘Uniters’. Aesthetically, it’s a bit like being a team of superheroes. Compared to being called a number or being identified by one’s category, who wouldn’t prefer being called ‘Uniter’, ‘Peacemaker’, or ‘Humanitarian’? The theme of ‘unity’ provides a rich context for inspiring, evoking, sharing, discussing, and reflecting on action. An emphasis on action will be particularly important in the spring when this class prepares their PYP Exhibition, a self-directed inquiry project with the ambitious goals of authentic action, community service, and engagement with globally significant issue. Along the LX Design line of inquiry, I realized that we need an interactive tool to document and share our ‘action’ in its various forms. At first I considered digital tools, but none seemed to provide the immediacy and high visibility required. Thinking of my wife, Yuka‘s ‘inspiration board’ at home, I wondered if a bulletin board would be best. The following tweet from Craig Dwyer and the informative Action in the PYP document to which it links helped to stimulate my thinking further. 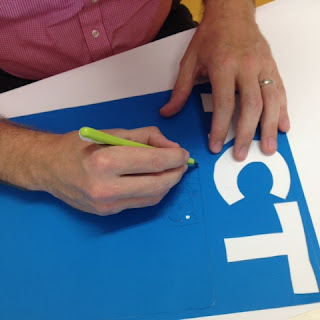 The primary goal being to move students’ awareness from thinking about action to planning and doing, our classroom dry erase whiteboard would be ideal. It’s an easily accessible space, simple to edit, conspicuously located near the front door, and doesn’t get much use other than reminders and doodles otherwise. However, we also needed the capability of categorizing our actions and seeing them develop through different stages, sharing and discussing. Although it would take a substantial amount of work, I set out to make a laminated paper graphic organizer. It was a bit of a tedious process, but therapeutic, and an opportunity to model independently and carefully completing a project for my students. My first iteration had a fatal flaw in that the categories (thought, emotion, planning, conversation, making, reflection) did not properly evoke action. An ‘action’ chart should be made of verbs. After disposing of two thirds of it, and having the presence of mind to ask a passing student to take a ‘working in progress’ photograph, I created a second draft with categories in the more satisfying ‘-ing’ form. When various forms of action occur to us, we write them in the appropriate boxes. Weekly, we visit the chart and discuss its contents. Often, students have taken action to pursue their inquiries. In those cases, they generally move down the chart from ‘thinking’ or ‘feeling’ to ‘planning’ or ‘making’. Sometimes, they need help to continue their inquiries which comes in the form of advice, assistance, or even just a friendly reminder. 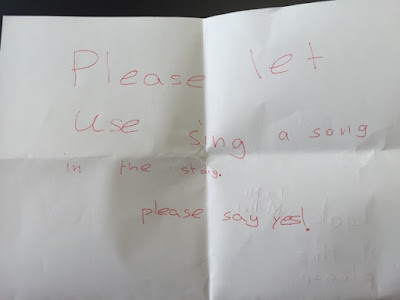 There have even been a few cases of students being inspired to take up other their peers’ lines of inquiry. It has also been useful for me as an organizer for action within our guided and structured inquiries. 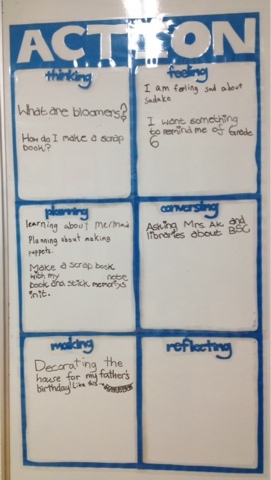 It has been effective to model the process of taking considered action and integrating our class inquiries with students’ independent inquiries. I look forward to exploring this more, perhaps by tweeting to other classes directly or joining in existing ‘chats’. In retrospect, I wish I had included ‘researching’ and ‘playing’ as categories. It is also critical to revisit the chart regularly, as it is too easy to fill it with a few questions and forget about it. Perhaps a more dynamic design is in order. Considering the meager utility the remainder of the white board gets, I’m considering making a new organizer that fills the entire board, includes additional categories, and has more visual appeal. Any suggestions are welcome! How do you document and engage with the process of taking action? March 31st is International Transgender Day of Visibility, and it’s a perfect opportunity for everyone, particularly teachers, to learn about the impressive progress being made toward gender equity and equality, and individual empowerment. 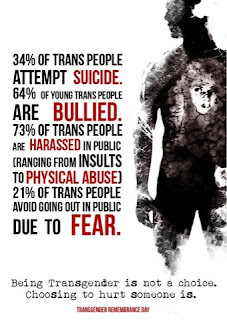 Visibility is the most important step toward acceptance and empathy, so I encourage you to visit the Trans Student Equality Resources site (transstudent.org) and explore their outstanding resources, particularly the engaging infographics. For more of my own reflection and classroom practices, please read my post, Empathy & Acceptance: Toward a gender-neutral classroom. The debates within and surrounding LGBTQ communities about gender identity and sexual orientation, and how individuals (and groups) express themselves, are reaching a sort of critical mass. Educators would be remiss to ignore it. Nobody explains the situation more fluently than Peter DeWitt, author of Dignity for All: Safeguarding LGBT Students. In the classroom, the first step can only be to tear down obvious and ubiquitous bias. As Dawn Casey-Rowe documents in the article, Does Gender Bias Affect The Way You Teach?, the negative effects of bias persist even when it arises from positive intentions. Pernille Ripp addresses the issue from a different perspective by asking, Are the Boys Welcome in Your Room?. I would argue that even the notion that boys and girls have stereotypical preferences should be categorically rejected in the classroom. Societies do not need any help promoting traditional gender roles. In fact, I believe that the messages from media and commercial ventures about gender and sexuality should be subdued, filtered, and contextualized in order to empower every individual to thrive. As an elementary educator, I feel the responsibility to promote a culture of Empathy and Acceptance. I am also in an ideal position to do so. 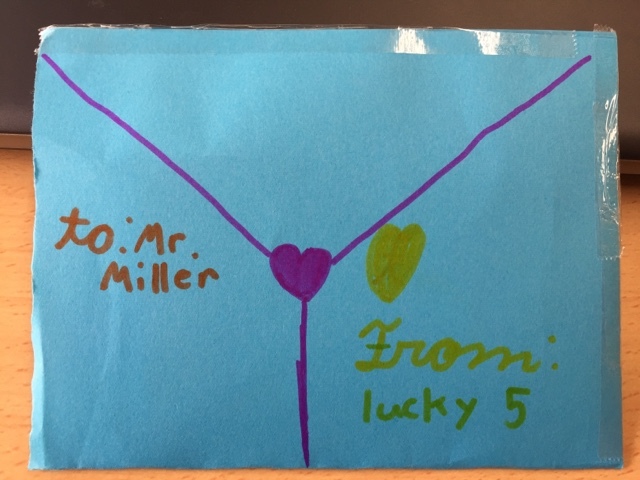 While I may not directly address gender and sexuality issues in my classroom as one would in secondary education, there are several practices that I have adopted in order to make my classroom a welcoming place for every learner. If we seek to design and manage a learning environment which is safe for inquiry, exploration, creativity, and collaboration, it must be based on trust. If children trust that the adults in their lives will never embarrass or pass judgment on them, particularly regarding such personal topics, a potential obstacle to learning has already been overcome. Modeling those behaviors for other students also nurtures a positive and supportive community. – Never group students according to gender. In fact, I would prefer not to indicate gender on role sheets because if the environment is truly inclusive, the only reason to know a person’s gender in advance would be based on an extraordinary special need. If a child tells me ‘I’m a boy’, then he’s a boy; if a child tells me ‘I’m a girl’, then she’s a girl. Otherwise, it doesn’t matter to me and shouldn’t matter to anyone. – Never generalize based on gender. For example, make statements like ‘some people prefer’ rather than ‘girls prefer’, or ‘people enjoy different activities’ rather than ‘boys like sports’. Freeing myself from gender stereotypes has been very liberating and helps my students to feel more at ease and accepted as they inquire into their identities. Play Fair is a wonderful blog whose mission is ‘fighting to end stereotyping in children’s toys and media’. – Students in my school change clothes for physical education classes, and I wish there were a more private option to having ‘boys’ and ‘girls’ changing rooms. Ideally, we would have private changing booths like clothing store dressing rooms, although I recognize the logistical challenges this would pose. – Design situations so that gender-based preferences or exceptions should never be necessary. – Rather than trying to appeal to perceived preferences related to gender, appeal to learning modalities, various forms of intelligence, and directly to students’ interests, as in Independent Inquiry. – Directly address conflict and debate related to gender and sexuality issues from the perspective of empathy and acceptance, and actively model the behaviors and thought processes associated with an open-minded point-of-view. Considered choices in classroom language can contribute a great deal to a culture of acceptance. In the Guidelines for Gender-Fair Use of Language by the National Council of Teachers of English, many simple and powerful suggestions are made. Substituting for inherently biased terms is also a good habit to establish. One of my favorite bloggers on Tumblr, Ben Crowther, shared a photo of a table of ‘Suggestions for Reducing Gendered Terms in Language’. Some that are immediately applicable in an elementary setting are to use ‘humanity’ instead of ‘mankind’, ‘firefighter’ and ‘police officer’ instead of ‘fireman’ and ‘policeman’, and ‘kinship’ instead of ‘brotherhood’. Many of these have become conventional already, and I expect that this progress toward more inclusive language will continue. Singular ‘they’ is a fascinating idea, though I must admit it feels rather awkward to use ‘they’ or ‘them’ when referring to one person, but has the potential to begin to dissolve the gender-specific nature of language. Another option is to simply use a person’s name whenever referring to them instead of using a pronoun and/or avoid assigning pronouns to people at all. It may sound strange at first, but with a bit of creativity, becomes as fluent and natural as the gender-based system we currently use. Save the pronouns for the things, and the dignity and privacy for the people! I certainly wouldn’t consider myself an expert, but I think this is a conversation educators should be having candidly. After all, how can we expect to model empathy and acceptance if we don’t practice it ourselves? 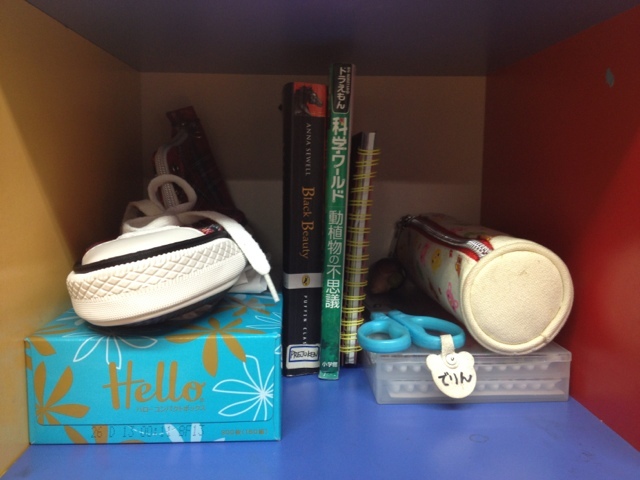 The shoe is actually a pencil case. Not all inquiries are particularly academic. 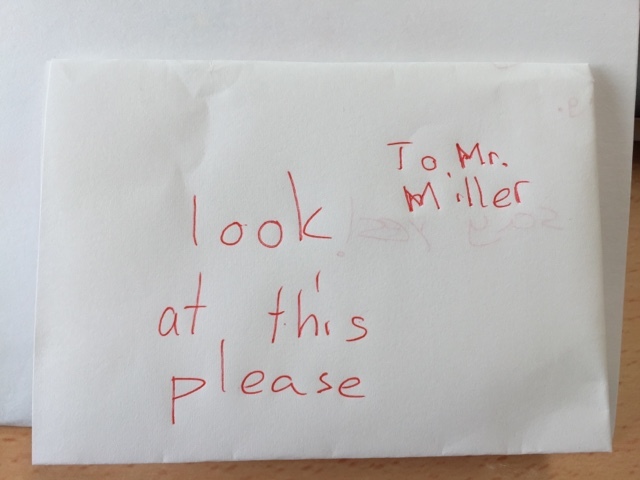 In fact, I’m always pleased when students’ goals focus on social, personal, emotional, physical, gastronomical, or any number of different categories of activities. In anticipation of the end of the school year, one student suggested cleaning personal spaces at school and at home. Many agreed to set it as a goal, although they agreed it was really a secondary goal and that no one had messy enough personal spaces to require a week of cleaning. 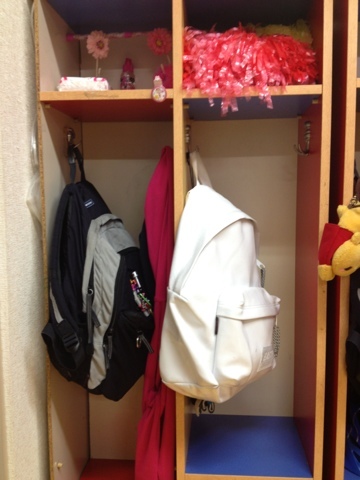 Lockers as neat as the first day of school. One unique feature the international school in which I teach is our relationship with the Japanese public school whose campus we share. 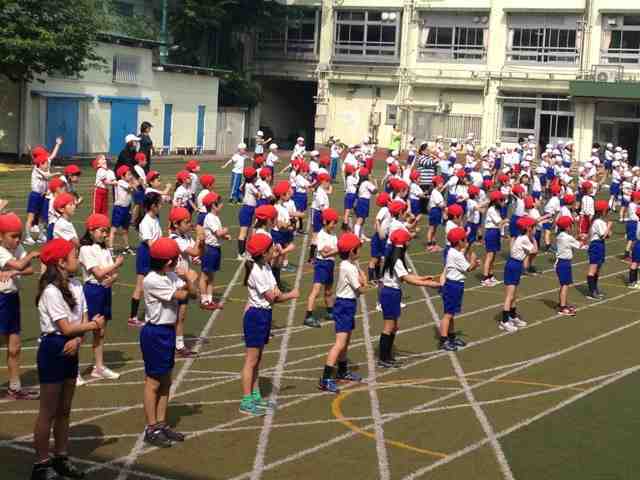 The students regularly engage in exchange activities and we are currently preparing for the annual sports festival, Undokai (運動会). All things considered, it is a very positive experience for our international students. In addition to challenging themselves physically, they benefit from the emotional and social shock of being dropped into the middle of this Japanese cultural tradition. They test their Japanese language skills and cultural adaptability. Team building, respect, trust, self-control, discipline, perseverance, and honesty are the keys to the Undokai, and, as with anything else, the learning is in the process. 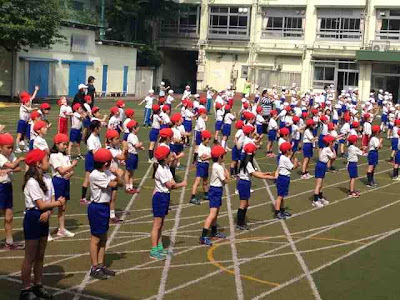 There is quite a lot of music and dance involved as well, particularly at younger grade levels. It’s a challenge for the teachers, as well, as we test our own additional language and cultural sensitivity skills. I even managed to do a handstand yesterday! Finally, the kids have fun. Certainly, not all activities appeal to everyone, but I think that is one of the most important lessons: Enjoy participating together; enjoy the enjoyment of others. 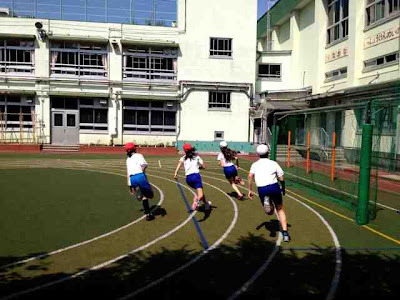 The 100-meter race is popular among students and is one of the only competitive events. What could be more important than what you are?